Thornton, K. (2016). Promoting engagement with language learning spaces: how to attract users and create a community of practice. Studies in Self-Access Learning Journal, 7(3), 297-300. The three institutions featured in this instalment have all shown considerable success in raising user numbers in recent years. In order to attract users to a language learning space (LLS), a number of factors need to be present. Potential users need to be aware of the existence of the space itself, and know its location. They need to have some knowledge of its functions, and feel that it has the potential to fulfil at least one of their needs as a language learner (Heigham, 2004). Then, they need to feel inspired enough to step into the unknown and have the confidence to enter and engage with staff and other users (Gillies, 2010). The space needs to have a welcoming atmosphere, and the interactions the learners have should provide them with a good balance of success and challenge in order to convince them to return and become regular users. The authors of the papers in this instalment explain the initiatives they have introduced to encourage more learners to come through the door, and the ways they have tried to make students feel that there is a place for them in the LLS. 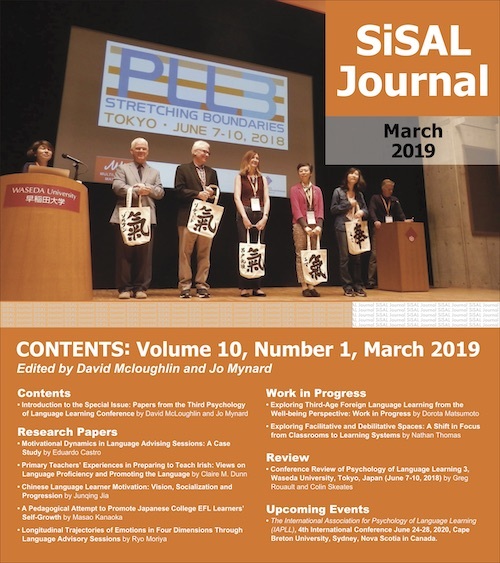 Simon Bibby, Kym Jolley and Frances Shiobara at Kobe Shoin University in Japan describe how they have seen numbers at English Island, their English conversation space, increase nearly 70% over a single year. They attribute this rise to several factors. Firstly, their recruitment procedures deliberately aimed to have a variety of staff: full-time and part-time faculty who would be known to many students, and younger staff closer in age to the students who work exclusively in the centre. Gillies (2007) has shown the importance of familiarity with staff as a factor encouraging usage. In order to create a welcoming atmosphere, people skills were particularly emphasised in the recruitment process, rather than putting a narrow focus on qualifications. The authors show how students were given basic personal details about the conversation lounge staff through flyers and how staff were encouraged to make connections with students at social events, in order to encourage them to join conversation sessions. The paper emphasises not only the importance of attracting new users into the centre, but on the conditions which must be in place for them to become regular users. All staff were given an orientation which emphasises the importance of people skills, and how to run conversation sessions in a supportive manner. They attribute the rise in user numbers to the staff’s success in providing a relaxed and supportive atmosphere during the conversation sessions, encouraging students to return regularly. Satomi Shibata at Tokoha University, also in Japan, describes the success she has had in creating a community of practice among English majors who initially showed little intrinsic interest in learning English. With little desire to study abroad or use English in their future employment, the author succeeded in creating a reading community through linking the SAC with the Extensive Reading (ER) programme in first year English classes. While many centres offer graded readers, and many English programmes incorporate extensive reading, Shibata has gone beyond this model and created a whole community of practice around ER. She emphasises the need for students to have a specific purpose to use an LLS, and for them to go through an acclimation period (Shibata, 2012) before they become full members of a community of practice, and demonstrates how ER can provide the springboard to this, with short book-borrowing visits leading to supportive conversations between users and staff about book choices and reading. These conversations can turn into advising sessions about language learning, which lead learners to engage with other aspects of the SAC, such as materials and conversation sessions. In this way, many learners have developed an intrinsic interest in learning English, with some of them studying abroad and even becoming SAC staff. Marc LeBane, Muriel Schilling and Austin Harris describe the system at the independent learning centre at Lingnan University, Hong Kong. Similar to the situation at Kobe Shoin University, they emphasise the effectiveness of having staff of a similar age to the students, Visiting English Tutors (VETs), who run several programmes focusing on academic learning programmes for English skills. While the staff at Kobe Shoin had little success with mandated usage of the conversation lounge, a detailed independent learning programme for all freshmen which includes participation in several academic learning programme sessions, has been successful at Lingnan, in emphasising the importance of independent learning. The other factor the Lingnan team identify in their success in raising attendance numbers is their eagerness to embrace new technologies to reach potential users. Through Facebook, Instagram and tailor-made YouTube videos, staff at the centre are able to both advertise their services and also engage students in English learning activities. The online sphere is regarded as not only a forum through which to attract users into the physical centre, but also a virtual extension of it, with online learning materials developed through a collaboration with other Hong Kong universities. These papers illustrate that different practices work in different contexts. Whether to require LLS usage remains a contentious issue. Lingnan has had some success mandating usage of their academic programmes as part of their learner training unit for freshmen (although the authors admit that more needs to be done to attract third and fourth year students), whereas at Kobe Shoin mandating usage of English Island had a negative impact on the existing users and no noticeable uptake of voluntary usage. In an earlier study, Rose and Elliott (2010) also demonstrate some benefits of mandated attendance, in terms of greater awareness of how to use the space and higher levels of satisfaction and comfort, but no claim is made about increased voluntary or sustained usage. Maybe this greater understanding of the space itself is the biggest advantage of some kind of mandated usage or orientation period, which, when combined with some of the other features mentioned in these articles, can result in otherwise one-time visitors (or non-users) becoming full members of a language learning community. This penultimate instalment of the column focuses on PR and attracting users, necessarily placing emphasis on the importance of getting learners through the door. While SALL practitioners will know that measuring student numbers is only one way of many to judge the success of a language learning space, it remains that “head-counting statistical data” is the most commonly scrutinised aspect of self-access for most institutional management teams (Morrison, 2005, p. 270), and of course, the starting point for any centre to build a community of learners. The final instalment of the column will focus on initiatives to evaluate the impact of a language learning space on its users. While this is a notoriously difficult task (Gardner, 1999; Reinders & Lazaro, 2008), the authors will describe different initiatives that they have undertaken to evaluate aspects of their learning centres. Heigham, J. (2004). Starting up self-access: An interview with Juanita Heigham. The Language Teacher, 28(6), 17-19.